As a foreign Jeju resident, it is a question that is often asked of me: What can Jeju do to become a global city? My response: Why does Jeju want to be a global city? The rationale tends to appeal to what Jeju should be aspiring rather than what Jeju is or has been. We should aspire to Hong Kong’s banks, Dubai’s shopping malls or Singapore’s English skills. Former colonies all, these megapolitan phoenixes and lauded models of globalization arose from the ashes of their former selves, a Pyrrhic victory Jeju must avoid. While some eyes light up with talk of the land sales, construction contracts and casino takings, most outside of the governing class are lukewarm at best. Far from Luddites, they merely want the right kind of development — on their own terms. To be clear, from paved roads and running water to shipbuilding and semiconductors, Korea’s progress has been welcome and astounding, but the fetishization of “progress” has come at a cost, weakening communal bonds and neglecting heritage. With bitter memories of colonization, war and national division — and, locally, the Jeju Massacre — tradition is often the antithesis of betterment for many, as seen in the 1970s New Village Movement, and even the 18th-century Seohak movement. Yet Jeju’s memories must not be forgotten. Auschwitz survivor Elie Wiesel knows well that the seeds of our future are found in tradition, and therein is the wisdom handed down by our forebears. But Jeju is losing its memory, and thus its future. The drive to move blindly forward dislocates the present from the past, and the Free International City is realized in ordinance only, anathema to the bed of tradition that is the DNA of the island. This is not a Jeju problem, per se, but a problem of global capital knowing the price of everything and the value of nothing. And we are all party to it in some way. Despite boasting one of the richest shamanic heritages in the world, Jeju’s shrines are neglected and even vandalized. Amidst the cultural revitalization of Jeju’s old town area, historic buildings are destroyed to make way for hotels and shopping districts. Developers’ dream of building towers into Jeju’s skies and fences around its fields and beaches. Even Jeju’s oreum are under threat, with developments looming at their bases and erosion threatening their peaks. In this pathological rush to be global, the yuan investment does little to address social inequalities, even increasing social division through exclusive enclaves, casinos and the commodification of heritage in theme parks. The short-term benefits may be quantifiable — one-time investments and part-time jobs — but selling off the family silver compromises future autonomy and sustainability, begging the question: Freedom for whom in this “Free International City”? When I think of freedom, I think of inherent confidence and openness borne of a true understanding of worth and essence. Not only are free cities confident, they are vibrant and driven by cultural activism. They represent sustainable and inclusive futures where hopes and dreams are voiced by a diversity of mouths free of self-conscious marketing slogans. Rather than building higher and higher into the skies, Jeju should look down to its streets to foster the artists and entrepreneurs in its midst through cheap rents and reoccupied urban spaces. Jeju can surely punch well above its weight, yet while its skyscrapers will never reach the heights of its cosmopolitan cousins, it can surely stand shoulder to shoulder with them on other terms. And this is the crux: While Jeju can surely aspire to be a pseudo-Hong Kong, Hong Kong can never be Jeju. Understanding this, in policy and spirit, is to have faith in Jeju’s true voice, coming both from within its multiplying high-rises and from behind its retreating stone walls. 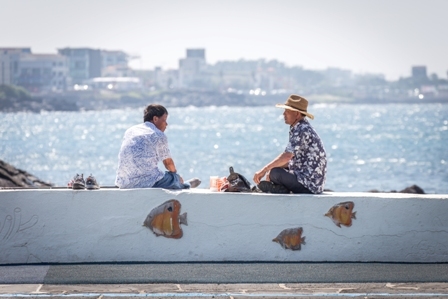 Embedded in the grassroots, Jeju’s traditions already contain the seeds of its freedom. If nourished and provided fertile ground, such as in the flourishing Wondoshim art enclave, they can continue to blossom in the years ahead, a fruit as plump as the island’s mandarins. So, as Jeju jostles for position at the heart of an Asian region leading the next century, it can rest assured that its future is already rooted in place, in the volcanic soils tilled by generations. According to the Bruntland Report (1992), sustainable development meets the needs of the present without compromising the ability of future generations to meet their own needs. Our future needs, those of our descendants and future Jeju Islanders, are not only environmental, as in the classic reading of this text, but also cultural. What is the meaning of freedom if a proud heritage is neglected before being reproduced, packaged and sold? On Jeju, these all intertwine: Jeju’s oreum, gotjawal and Mt. Hallasan are not only monuments to the miracles of nature and volcanology, but at their essence they are also the fruit of the Jeju people’s rich storytelling and religious traditions. The next generation has the right to inherit this bountiful land, and it is the duty of not only the government but all Jeju residents to bequeath its stories intact. Jeju may never become a Free International City, but nothing is as universal as a good story, and the island has plenty of those to tell.